Evernote released a major update to its Android app today, bringing a revamped design and more camera-related features to the note-taking app. Evernote 5.0 is available now from the Google Play store, and offers a new Multi-shot Camera mode that allows you to take multiple pictures at once and save them to a single note. A feature called Page Camera also turns the camera into a scanner, and lets you save a digital version of paper notes and documents into Evernote, simply by taking a photo. 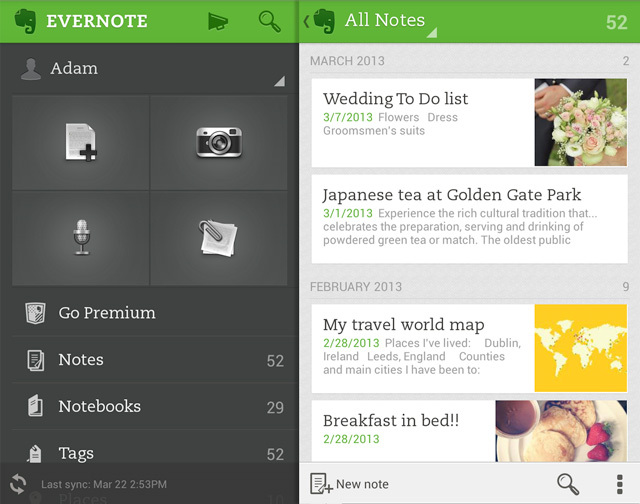 I got a sneak peek at Evernote 5.0 over the weekend, and Page Camera worked great. I was worried when my notes looked dark and blurry in the camera’s preview pane, but the final result was bright and clear. I was able to read my notes without a problem (well, aside from trying to decipher my illegible scribbles). Of course, those who invest in an Evernote Smart Notebook from Moleskine will get even more functionality, including the ability to tag notes using the included Smart Stickers. Premium account holders will also be able to search for any files created in Microsoft Office, iWork or Open Office by keyword. Shortcuts are also new to Evernote 5.0 for Android. The feature, which gives you the ability to quickly access notes, notebooks and tags, was first introduced to the Mac version of Evernote in January. But this will be the first time it’s available on any of the company’s mobile apps. Other changes include a redesigned Notes list, new icons and tag support for Evernote Business. Evernote has about 50 million users and is available on multiple platforms, including Mac, Windows, iOS and Android. Earlier this month, the service suffered a security breach and required all of its users to reset their passwords. The company has since announced that it plans to roll out two-factor authentication later this year.